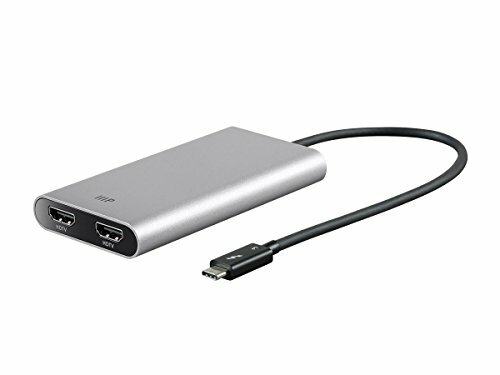 The Monoprice Thunderbolt 3 Dual HDMI Output Adapter lets you add two 4K@60Hz HDMI monitors to your Windows or Mac computer using a single Thunderbolt 3 port. It is compatible with all the features found in the HDMI 2.0 specification and supports HDCP 2.2. It delivers up to 40 Gbps of bandwidth and up to 15 watts of power. Experience uncompressed, vibrant, 4K@60Hz video and authentic audio supported by monitors with a HDMI 2.0 input for gaming, video streaming, or a multiple monitor desktop configuration. Compatibility:The adapter is compatible with Thunderbolt 3 equipped Mac and Windows PCs and laptops. Dual 4K@60Hz:Connect two 4K@60Hz HDMI displays to your Thunderbolt 3 equipped Mac or Windows PC or laptop.